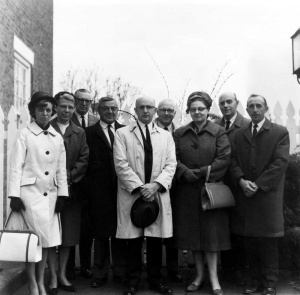 The Mennonite Historical Society of Ontario (MHSO) held its first meeting on 8 May 1965 with 35 persons in attendance. Orland Gingerich gave a presentation on the reasons to form an historical society, and Conrad Grebel College President, J. Winfield Fretz, led a discussion on possible organizational approaches. The option of a society closely related to the College received the most favor. The founding purposes approved at the 5 June 1965 organizational meeting included promotion of interest in and the dissemination of information concerning Anabaptist-Mennonite history generally; support of research in Ontario Mennonite history; encouragement of publications in the field of Ontario Mennonite history; support of the Mennonite Historical Library and Archives at Conrad Grebel College through encouragement of donations of books and documents relevant to Ontario Mennonite history. J. Winfield Fretz, became the Society's founding president; the founding board of directors included Lorna Bergey, Barbara Coffman, Henry Dueck, J. Winfield Fretz, Orland Gingerich, Wilson Hunsberger, Elven Shantz, Earle Snyder and Dorothy Swartzentruber. The initial membership was about 40. The Society has generally held two public meetings per year, sometimes in combination with bus trips to historical sites in Southern Ontario. The initial bus trip was to Vineland, Ontario. A longer bus trip to Pennsylvania was sponsored in 1983. The Society has also helped to sponsor a variety of dramatic presentations. A centennial pageant, "The New Commandment" by Barbara Coffman was performed in 1967. A stage play, adapted by Norma Rudy from Mabel Dunham's Trail of the Conestoga, was mounted three times (1969, 1970, 1973) and a film of the play was released in 1977. Two shorter film productions were "And When Their Time had Come" (a 45 minute dramatic documentary filmed in 1971 about the Mennonite experience in Russia and subsequent emigration to Canada in the 1920s) and "Beyond This Land" (a 42 minute Amish Sesquicentennial historical pageant produced by the Mennonite Historical Society of Ontario presented in the Stratford Festival Theatre in 1972-1973, based on a script by Urie Bender). John E. Brubacher House, 2003. 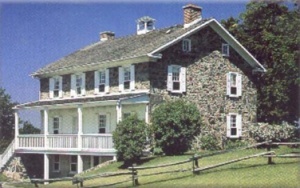 Brubacher House Museum -- located on the North Campus of the University of Waterloo, this 1850 stone farmhouse was built by John E. and Magdalena Brubacher. Already in the 1960s plans were underway to restore the house as a museum. A fire in 1968 gutted the house, so the subsequent recreation of the interior took several years. The Society was asked to furnish the main floor of the Brubacher house and to develop the programming for the museum. Lorna Bergey, long-term secretary of the Society coordinated the gathering of furnishings for Brubacher House. The furnishings reflect the style of a 19th century Ontario Mennonite farm house. Most of the furniture was donated by Mennonite families in the Waterloo region. The upstairs became a furnished apartment for museum hosts, often either a young married couple or a retired couple. For many years a slide presentation prepared by Paul and Edna Hunsberger, then a host couple, introduced visitors to Pennsylvania German life and culture. In 2005 the Society prepared a 15 minute video introduction to the Brubacher family and Brubacher House Museum. Detweiler Meetinghouse, Inc. -- located just west of the village of Roseville, this 1855 stone meetinghouse had been part of the Mennonite Conference of Ontario until services ended in 1966. It was rented for a time to other groups and remained empty for a time. The conference responded to appeals from local groups, including the Historical Society, and transferred ownership of the meetinghouse and the adjoining cemetery to a local board. Three members of the board are appointed by the Society. The restoration to a 19th century meetinghouse interior was completed in 1999. The facility has been used for weddings, musical events and other rental groups. The Society has published a semi-annual periodical since 1983 under two titles: (Mennogespräch (1983-1992) and Ontario Mennonite History (1992- ). Editors have included Sam Steiner (March 1983-March 1991); E. Reginald Good (September 1991-September 1996); Lorna Bergey (April 1997); Brent Bauman (October 1997-June 2005); and Barb Draper (November 2005- ). The Society was the formal sponsor of the Mennonite Bicentennial Commission which celebrated the 200th anniversary of Mennonites in Canada in 1986. The Society is also a member of the Mennonite Historical Society of Canada, which it helped to form jointly with the Manitoba Mennonite Historical Society, as a means to sponsor the Mennonites in Canada history book series by Frank H. Epp. Lorna Bergey served as secretary of MHSO from 1968-2000, and was a board member for 37 years. She was the "engine" that provided organizational energy during her years of service. "History." Detweiler Meetinghouse, Inc. Web. 6 November 2010. http://www.detweilermeetinghouse.ca/. Steiner, Sam. "Mennonite Historical Society of Ontario." Global Anabaptist Mennonite Encyclopedia Online. October 2017. Web. 21 Apr 2019. http://gameo.org/index.php?title=Mennonite_Historical_Society_of_Ontario&oldid=163101. Steiner, Sam. (October 2017). Mennonite Historical Society of Ontario. Global Anabaptist Mennonite Encyclopedia Online. Retrieved 21 April 2019, from http://gameo.org/index.php?title=Mennonite_Historical_Society_of_Ontario&oldid=163101.